This chopped kale salad, with the pop of pomegranate seeds and creamy avocado, is truly one of the best salad recipes I’ve made. It’s safe to say that this is one of the best salads I’ve ever made. 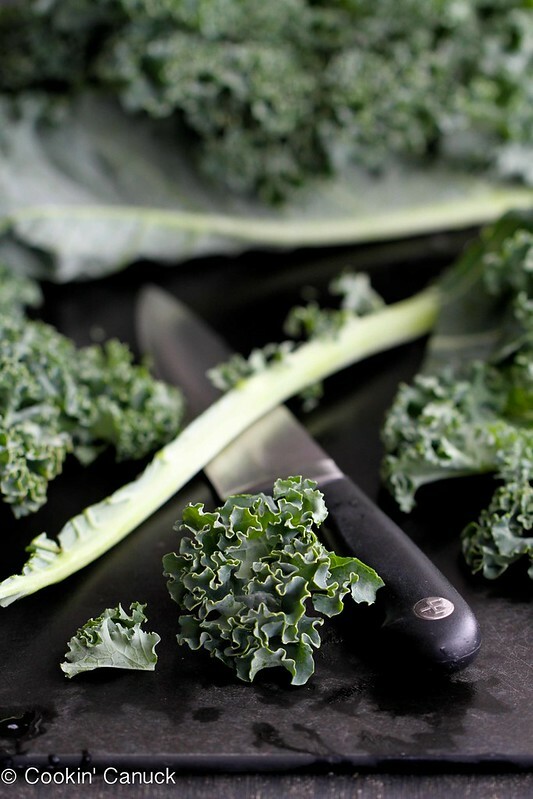 I never really thought that I’d say that about raw chopped kale, but I am forever smitten with this dark leafy green. Add the pop and tang of pomegranate seeds, creamy avocado pieces, a bright lemon dressing and a smidgen of Parmesan cheese, and you’ve got a keeper. The inspiration for this salad comes in the form of one of my favorite people that I’ve met on this blogging journey; someone who is so down to earth that we might have to hose the dirt off of her. Kelley is the blogger behind Mountain Mama Cooks and she lives within spitting distance of the Park City ski resorts, and about 40 minutes from me. Not only does she make recipes for her blog, photograph them beautifully and share them with the world, but she also runs a very busy personal chef business (those lucky clients! ), raises two beautiful little boys and snowboards like nobody’s business. A modern day, alpine superwoman, I’d say. Kelley and I, along with our families, got together for a winter feast (cheese and beef fondues included) and shared the recipes in the debut issue of Foodiecrush Magazine last year. See the online version here (our feature starts on p. 62). One of the stars of the day (well, besides Kelley’s youngest…you just want to kiss those cheeks of his) was Kelley’s Kale Salad with Currants, Pine Nuts & Parmesan. It was my first experience with raw kale and I was blown away. This was a salad I could eat all day, every day. This salad is my way of tipping my hat to Kelley and thanking her for introducing me to this vitamin-packed food. Pomegranates, which are shown to lower the risks of various cancers, are at their height right now and seemed like a natural pairing with the kale and avocado. If you’re uncertain about seeding them (I was too, at first), head to my post on How to: Seed a Pomegranate. Their pleasing pop and tangy flavor add something special to green salads. Now, on to the salad. 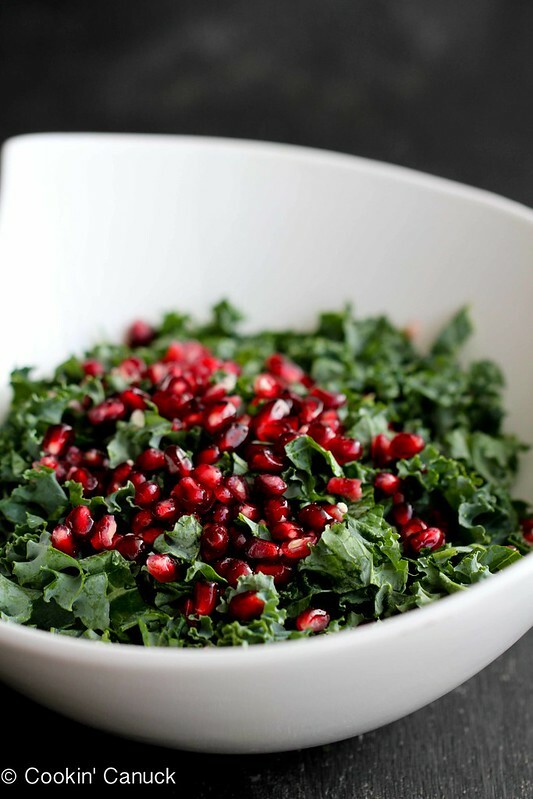 In a large bowl, combine the kale, pomegranate seeds, avocado and Parmesan cheese. Toss gently. In a small bowl, whisk together the lemon juice, olive oil, agave nectar (or honey), salt and pepper. Pour the dressing over the salad and toss to coat. Serve. I love this Winter salad!!! I also love adding avocados because they almost because part of the salad dressing. Yum!! Interesting, I’ve had kale chips and sautéed kale but have never had it raw. I think my time has come! Also, do you know what kind of kale you have pictured up there? I always see so many kinds at the grocery and never know which one to get. You are too kind, my dear, dear friend! What sweet words! 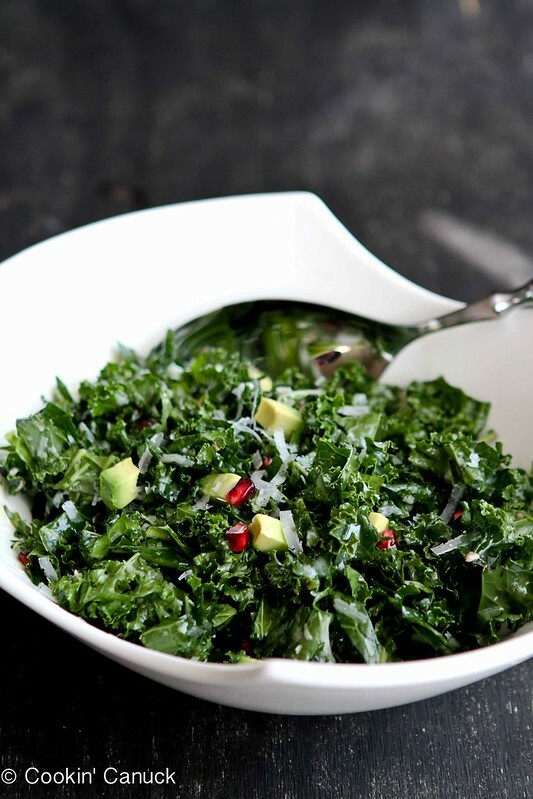 I DO love raw kale in salads and this looks amazing! 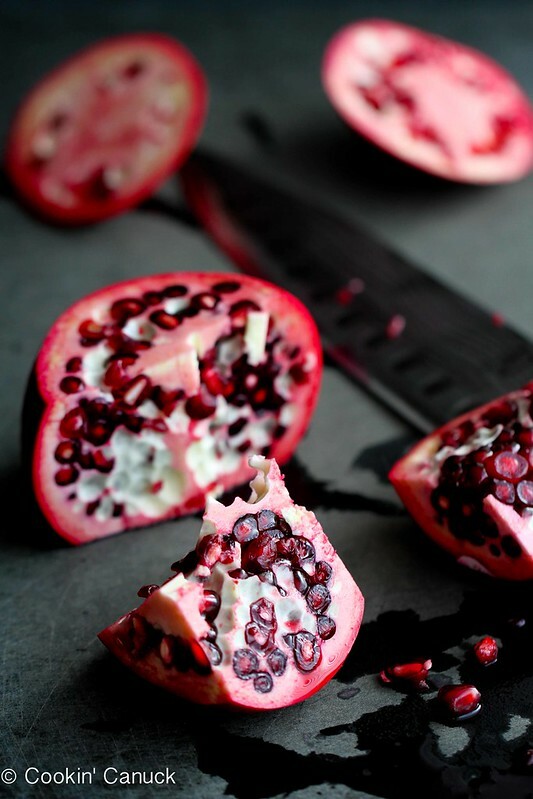 I love the wintery addition of pomegranates. Looking forward to the tutorial this weekend as I usually hack mine into such a mess! Have a great day! 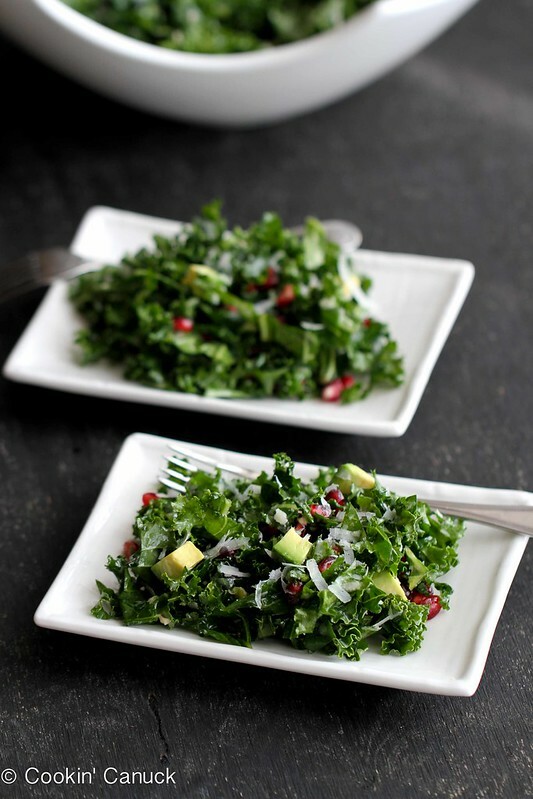 I’m always looking for new ideas of how to put kale to use, and I adore pomegranate and avocado. Will definitely be trying this one, thanks! Dara, I’m so glad my friend Aggie (Aggie’s Kitchen) told me about your site. Love it! And I’m so excited to try this recipe…. I actually “pinned” the Mountain Mama Cooks salad and made it… SO good! Can’t wait to try this version. The perfect winter salad!!! STUNNING. And I want to smash my face right in that. BTW, your photos are looking incredible. Gorgeous depth of field. The first time I ate a kale salad was is Maui. Then again at Spinnakers in Victoria . Both times I asked the server how they got the kale to be so ‘soft’. The response in both cases was that they wash the kale in very hot water – then ‘massage’ it with the oil dressing. I tried it and it works brilliantly. I love everything that’s in this salad, plus it’s so pretty! My grocery store just started carrying baby kale so I’ve started buying that to save time on chopping (I’m lazy like that :-)). Such a pretty salad, I love the pomegranate arils and lemon dressing! I’m still unsure about raw Kale, but apparently I just need to get over it! This salad looks amazing, love the pomegranates and avocados. So simple and soooo beautiful! 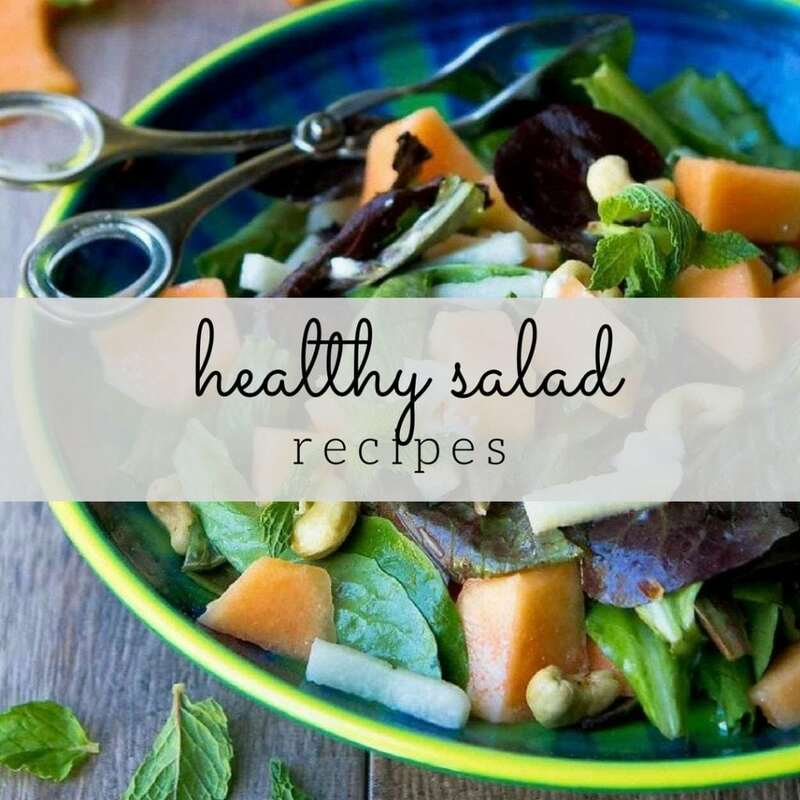 Love the healthfulness of this salad! Hi, Dara! Thanks for visiting me. I am very excited to try this gorgeous salad. It contains 2 of my favorite ingredients: Kale and avocado. In my country, kale is a must-have. Although, we use avocado to prepare smoothies and desserts, I already got used to have it in salads as well. 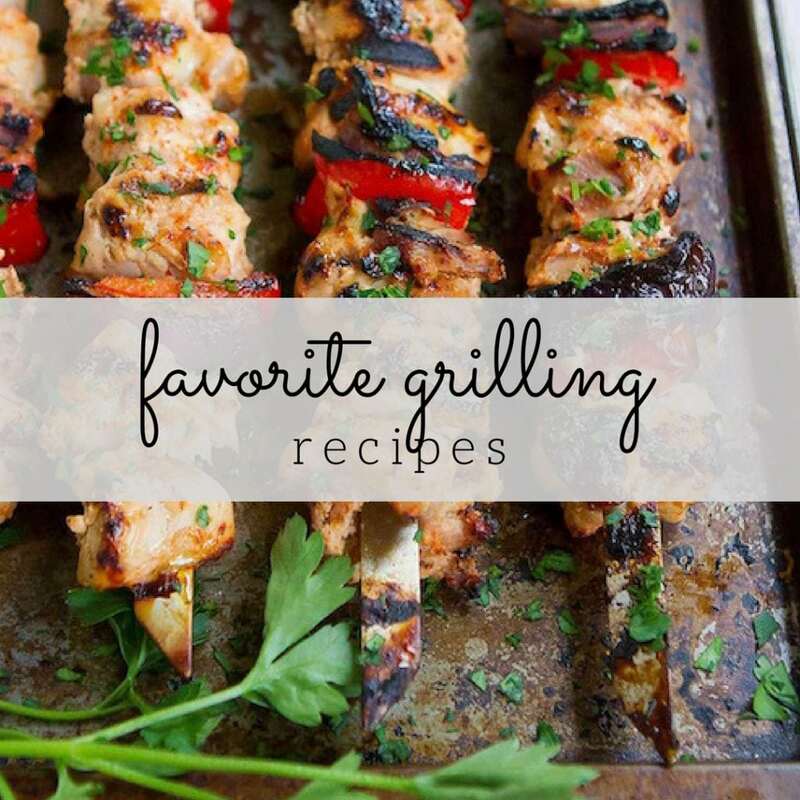 Love your recipe index — it is full of nutritious dishes. I’ll have to prepare some of them — I need to lose several pounds. Wow Dara, your photos are so lovely! So great of your friend to introduce you to the power of kale. It’s quite fantastic, I must say. It’s so great to see how others prepare it, too. Great recipe! Beautiful pictures and the salad looks great, very different combination, I´m going to try it for sure, saludos from Spain ! Gorgeous photos! The salad just seems to jump right out of my laptop! I have the BEST EVER way of getting arils out of a pomegranate: I hand it to my daughter! Adding this to the ‘ways to incorporate more avocado into my life in 2013’ list. This is the perfect winter salad. Beautiful, Dara! Loving this! I’m all about kale lately. I love a good in-season salad. Your pictures are beautiful, by the way! A salad never looked prettier! This is so beautiful! Love the contrast of red pomegranate seeds against the dark green of kale. Ooooooh my – Could this salad get any better?! Just been browsing through your blog!! Thanks for sharing the recipe’s. Also, you’ve got the BEST pictures! I love a good kale salad like this. Looks awesome! The colors in this are just gorgeous and I bet the mix of textures is perfect! I love kale, but it’s rough for me to eat raw, unless I chop it small add it with other greens. Love the addition of pomegranate – of course! I love kale salads. This looks lovely with the pomegranate. Thank you for the link! Love this salad! It’s gorgeous! I can’t think of a more beautifully perfect combination!!! Wow. Healthy and delicious are an unbeatable combo! This is so bright and perfect for winter! This does sound good! I’ll have to give raw kale another try. I adore kale but haven’t been able to get used to it raw. MMMm..looks really yummy .. I wish I stumble on this recipe earlier when I had a pail ful of pomegrantes.. I’ll surely try it tho. I love, love, love Kale! Such a yummy salad- thank you! What a beautiful winter salad! I remember seeing your article in last year’s Foodicrush magazine – it looked like so much fun! We had this for dinner last night. It was so fresh and tasty! I am now totally into kale. 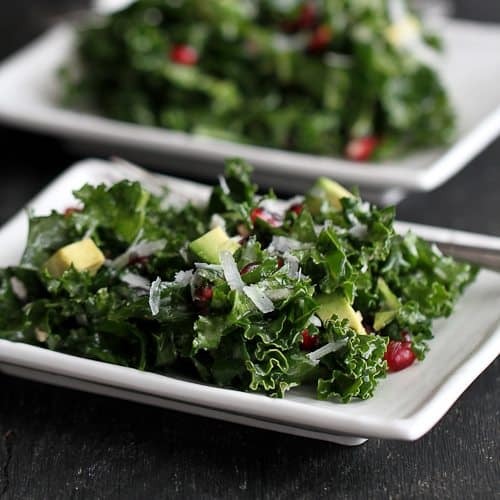 good salad, dont agree with the prep…… toss the kale in the dresssing and massage the kale to soften and THEN toss the the other ingredients gently. Massaging kale in salads is huge. Good recipe tho! i love it ! Thank you very much ! 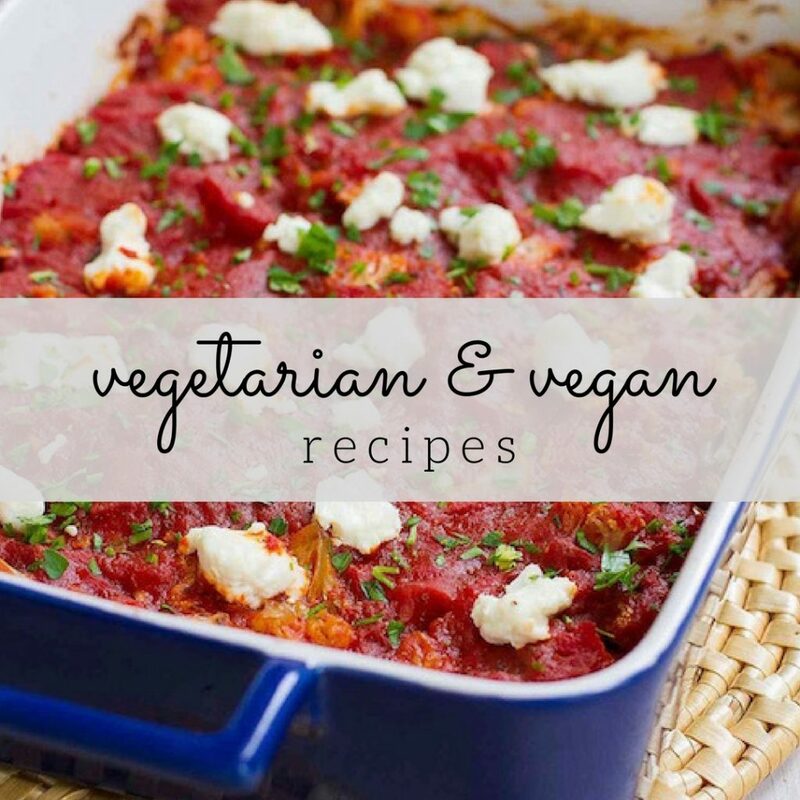 Absolutely love it…used the cavallo kale or red kale as well…sometimes feta…thank you!!! get facts on the topic of my presentation focus, which i am going to convey in college. I’m taking a look ahead for your subsequent put up, I will try to get the cling of it! thanks again for the spectacular techniques you have contributed in this article. Loving the sound of this simple but delicious salad! I also love bringing kale salads to picnics because they don’t end up wilting! and that you know people will want to buy it. to subpoena Google’s Legal Division. What a perfect healthy recipe and your pictures are so real and beautiful! !